We understand that machines are simple, it’s us “humans” that are complex. “We the humans” have assorted personality traits, behavior patterns and value structures. We ourselves change every decade or so and our mindsets evolve too. The society and culture we live in has it’s overarching influence in how we behave, think, speak, see, feel and act. We cannot just build products and push technology because we can! The onus is on us, the design community to make sure we anticipate and answer the unspoken needs, un-articulated wants and the latent desires of end-users, and blend in those emotional attributes with the functional specifications. Let’s try to understand how we investigate and uncover ideal user experiences across the entire set of multi-users. How we carefully design, develop and build a portfolio of meaningful products and services per those intended use cases. How we squeeze that expected product interaction into our artifact to make it useful, usable, ergonomic and beautiful; to make sure it seamlessly jells in the end-user’s existing and aspirational lifestyle. Our studio, Sundberg-Ferar is the nation’s 2nd longest standing independent industrial design studio, which was born right here in Detroit, in 1934. Our sole reason for existence as a design studio is: To make everyday products a bit better and a bit more beautiful. In this webinar we will share some of our vantage points and insights, accumulated from our experience of 85 years of product design, design research and innovation strategy. 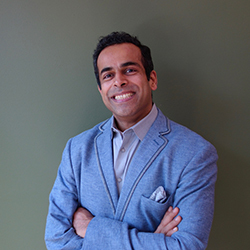 Jeevak brings energy, passion & curiosity to his role as VP of Strategic Growth at Sundberg-Ferar, a full service Product Innovation Studio supporting the Product and Vehicle industries from its Metro Detroit location, since 1934. He helps companies to understand the fundamental role of Industrial Design Thinking: leveraging usefulness, usability, ergonomics & aesthetics as unique and compelling differentiators in your products to aid the sustainable growth of business, and planning for the entire range of use-case scenarios and designing for ideal user experiences. With his unique blend of education and experience in design, engineering and business he is a rallying voice for the alignment and optimal inclusion of end users’ un-met needs, unspoken wants, and unarticulated desires in the core value proposition offered by the products & service portfolio, to generate sought-after shareholder value. He has 23 years of work experience, 7 years in India (Tata Motors ERC, Tata-Johnson, Voltas M&H) and 16 years in the USA (GM Design Center, ASC and now SF studio). 1. Bachelor’s in Mechanical Engineering, Pune University, India. He lives in Rochester Hills, a northern suburb of Detroit, MI with his wife and two notoriously curious kids. He loves bird photography, kickboxing, astronomy, organic backyard gardening and obstacle course running.